The experts at ProSource® of Mokena understand how exciting a bathroom remodel can be for you and your customer. We provide various bathroom products and materials to make the project go smoothly from start to finish. If you’re in need of a second opinion or account management help, we can assist. Visit our showroom in Mokena today to get started. 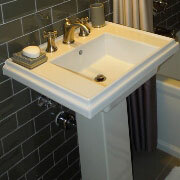 When it comes to your bathroom sink, you want it to fit in with the style and design of the rest of the bathroom. Do you want a pedestal, vessel, or shroud style? Which colors compliments the rest of the space? Find the best sink products at the ProSource of Mokena showroom. 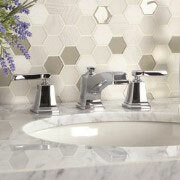 Your sink will probably need a faucet, which begs the question: which sink faucet do you choose? Our generous collection of faucet styles, designs, and hardware allow you and your customer to find the perfect fit for their bathroom sink. The shower is a moderately popular feature in any bathroom. It allows us to get clean, and we tend to have our best ideas while showering. This means the style and design of the shower is important. Where do you place the head, faucet, and handle? The ProSource of Mokena experts can help you with your shower remodel. It’s tough to find extra storage space in an already over-utilized bathroom. Have you considered a bathroom vanity? It offers counter space, extra storage, a mirror, lights, and more. 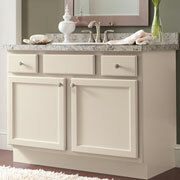 We have multiple vanity choices in our Mokena showroom. Visit us today! You can choose from a generous collection of materials for your bathtub remodel. 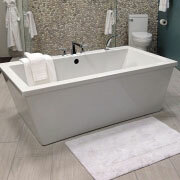 Whether you and your customer decide on a standard tub or a jacuzzi style, our experts at the Mokena showroom can help. 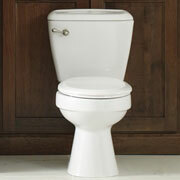 Deemed “the throne” in most households, the toilet is one of the most highly trafficked bathroom feature. Choose from our Mokena selection of new toilets, or find toilet hardware to upgrade your current toilet. ProSource is here to serve you and your customer.